This Spring-worthy quilt pattern features spinning star blocks and fabric filled with buds, vines, clouds, grass and more. 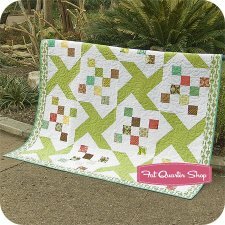 This quilt is perfect for the park, a picnic, or bringing some Spring sunshine indoors. "Since I google everything, I started with, "How to make a quilt." I searched through dozens of websites, and that's when I came across blogs. It's between magazines and blogs, that I taught myself how to quilt. And that's when the fun began!" "I've taught and will continue to teach. I've been featured in quilting magazines. And the designer of a whole quilt pattern line, Rachel Griffith Designs. I'm proud of what I have accomplished thus far, but I'm excited to see what lies ahead."